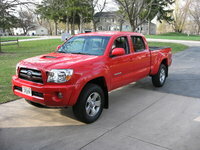 Most trucks that turn heads are just a shallow empty shell, but the 2011 Tacoma is a lot more than just a looker. This true all-star midsize boasts up to 6,500 pounds of towing capacity and the only available 6-foot bed with a Crew Cab in any compact or midsize truck, on top of historically excellent reliability and utilitarian style. The current Tacoma offers your usual cab bodies - regular, Extended Access Cab, and the Crew Double Cab - with a 6-foot bed available across the board, but the Double Cab using a 5-footer by default, all of which are available with either rear-wheel (RWD) or four-wheel drive (4WD). All but the 4WD Double Cab use a 2.7-liter 4-cylinder by default with the option of a 4-liter V6. 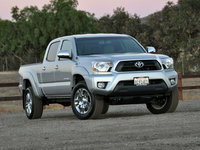 This year the Tacoma gains an automatic transmission for the 2.7, a couple new off-road options, standard air conditioning across the board and bucket seats for all but the 4WD regular cab style, making the 2011 Tacoma the most significantly modified edition since the '05 transmission upgrades for the V6. Now paired with a 6-speed manual by default or the option of a 5-speed automatic transmission, the V6 puts out 236 hp and 266 lb-ft of torque and gets up to 17 mpg in the city and 21 on the highway. The fuel-efficient four-banger is good for 159 hp and 180 lb-ft of torque and tops out at 19/25 mpg with its 4-speed automatic, though it gets a 5-speed manual by default. Unlike most baseline trucks, the Tacoma regular cab offers true work utility with a limited-slip differential, air conditioning, composite bed liner, bed utility rail system and a tilt-and-telescoping steering wheel standard. The base Access Cab gains power accessories and the expected interior upgrades while the base Double Cab adds bigger wheels and a front skid plate. 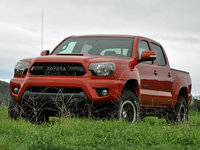 As for purely RWD Tacomas, the X-Runner and PreRunner afford the look and feel of a 4x4 without the bulk and expense, featuring tweaks and touches to suit their own particular styles - the street-streaking X-Runner, for example, is geared up with a body kit, hood scoop and 18-inch alloy wheels, while the PreRunner is similarly made out to look and feel like an off-road warrior. Options vary widely from region to region and body style to engine choice, but highlights of the list include power mirrors, keyless entry, cruise control, rear-view camera, leather interior touches and a stereo upgrade with satellite radio and Bluetooth connectivity. Several off-road packages offer features like fender flares, heavy-duty suspension, locking rear differential, skid plates, all-terrain tires and a cat-back exhaust, while an on-road sport pack offers a hood scoop, sport suspension and sport seats. Current drivers have no complaints about performance or utility, but the seats could be more comfortable and the squeaky, mushy brakes are a common complaint. 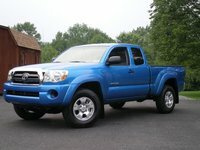 Lead-footed drivers will not experience much improvement in the fuel economy over larger trucks, but drivers looking for a nimble big-toy shopping companion certainly don't mind sacrificing the unnecessary power for the Tacoma's improved maneuverability despite the slight difference in economy. The Tacoma is rooted in an exceptionally long history dating back to 1935, with the very first incarnation of Toyota's truck - dubbed the G1 - helping Toyota become an official auto manufacturer. American buyers first got their hands on a Toyota truck with the 1964 debut of the Stout, and drivers around the world have been beating on the HiLux since 1967 - known simply as "the truck with no name" in the 70's and 80's - and it is still around today for international drivers. It wasn't until smack in the middle of the '95 model year that the seventh-generation Toyota pickup officially became the Tacoma we know and love today - impeccable reliability history and all. Although the debut half-year was also somewhat half-hatched, Toyota was quick to address every issue and has since made the Tacoma into a local hero - just like its HiLux older brother, which has become the champion of rural business around the globe. 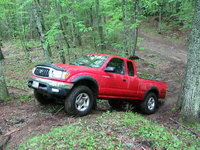 The original Tacoma offered at best 190 horses from its mighty V6, the default choices being one of two four-bangers. Although strictly 2-door regular or Extended Cab (Xtracab) body styles were offered, buyers could choose rear-wheel (RWD) or four-wheel drive (4WD) with either a 5-speed manual or 4-speed automatic transmission. 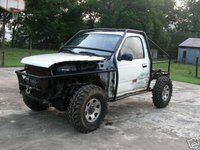 Passenger-side airbags debuted for '98, a year before they were mandated, and a faux 4x4 PreRunner joined the Tacoma lineup with RWD. 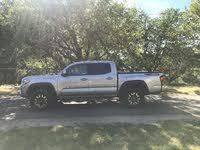 Six years into this generation the Tacoma finally gained a Crew Cab (Double Cab) body style, featuring 4 doors and a short bed. In the following year it was named the most wanted truck of 2002 and remained largely unchanged - and a wild success despite its unremarkable style - until the next generation debuted for 2005. The second-generation Tacoma has been powered by the very same 2.7-liter 4-cylinder and 4-liter V6 since its birth, the former putting out 159 horses and 180 pound-feet of torque with the V6 offering 236 hp and 266 lb-ft of torque for a maximum towing capacity of 6,500 pounds. Originally just 5-speed manual and 4-speed automatic transmissions were offered alongside these engine choices, but the following year brought 6-speed manual and 5-speed automatic transmissions for the Crew-Cab-standard and otherwise optional V6. With the addition of two rearward doors came the Access Cab name for the Extended Cab body style, replacing the tight two-door Xtracab while the Double Cab finally offered a full 6-foot bed, the first and only of any compact or midsize truck. 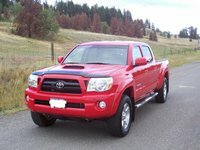 Stability and traction control became standard for '09, along with other safety considerations such as front side and side curtain airbags, but the current Tacoma is otherwise largely unchanged since its debut. In terms of reliability, even buyers digging into the no-name generation leading up to the official '95 birth of the Tacoma nameplate will find more than a few winners. Only the first few model years of each generation tend to have a few relatively silly problems, and those issues are usually quickly addressed with a refined replacement part eliminating the problem altogether in a simple retrofit. The '90 and '91 have some drivetrain issues without a retrofit, but opting for the manual evades most of the issues with just a whistle under 50 mph left to grin and bear with in the '90 to '94 bargain basement. Like the generation that followed it, these trucks are a bit tight for the tall hauler, but the 150-hp V6 offered in this generation is nearly comparable to the four-banger available today. For less than two grand, nearly any no-name of the sixth-generation Toyota pickup is a downright decent beater, if a bit outdated and boxy. The first official generation of the Tacoma ran from '95 to 2004, offering passenger-side airbags from '97 and the option of stability control in its final year. Again Toyota offered retrofitted fixes for the majority of the issues that cropped up, but the debut year is not worth paying twice the price of a no-name given its widespread annoyances. 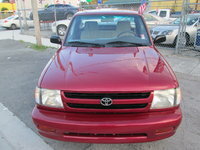 The '96 is a decent buy, but the '97 and '98 suffered from a few unresolved engine issues. 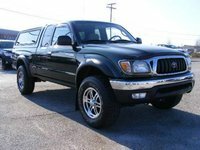 The tweaks for '99 improved on those somewhat, but the Tacoma engines were not perfected until 2002 - and it's smooth sailing from there without a significant problem in sight. Going for the '02 or later will mean digging up five figures, but these trucks hold their value so well for good reason. The current generation is not absolutely pristine, however - several minor annoyances crop up in any '08 or older Tacoma, but again Toyota has offered retrofitted fixes for the majority of these issues. The '08 is not as quirky as the other years, and in any case only one of the issues has anything to do with mechanicals - the check engine light may indicate a problem with the fuel pump that requires somewhat costly repairs. Drivers looking for a 4-cylinder will be in luck - these models lose their value quickly so a light duty '09 Tacoma is very easily within reach. 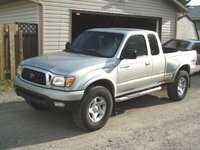 Those seeking more significant power will have to fork out a more significant sum, but the utter lack of significant changes after the '05 V6 transmission upgrade makes almost any used Tacoma one highly affordable modern truck. The 2020 Toyota Tacoma has been announced, but it is not yet available for purchase. 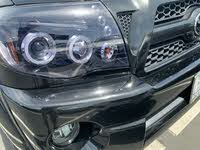 Start a new Toyota Tacoma question. What could cause my 2002 Tacoma 3.4L to miss? When I start it in the morning it runs fine, but then 3 cylinders begin to miss. New truck; just trying to do general service / maintenance and couldn't locate the transmission dipstick,for gosh sake(ever feel DUMB !) HELP !! 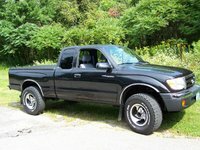 How many sensors are there in a 2003 Toyota Tacoma and where are the locations at?